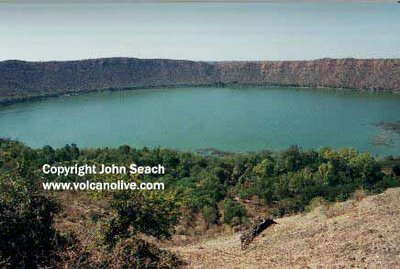 Examples of Deccan Traps lava piles and uplifts Lonar Meteor crater, now a lake, from geologically recent impact on Deccan volcanic deposits. See Lansat photo of crater below. 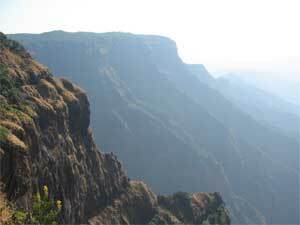 The Deccan Traps is a large igneous province located on the Deccan Plateau of west-central India and is one of the largest volcanic features on Earth. It consists of multiple layers of solidified flood basalt that together are more than 2,000 m thick and cover an area of 500,000 km². The term 'traps' is derived from the Swedish word for stairs (trappa, or sometimes trapp), referring to the step-like hills forming the landscape of the region. The Deccan Traps formed between 60 and 68 million years ago, at the end of the Cretaceous period. 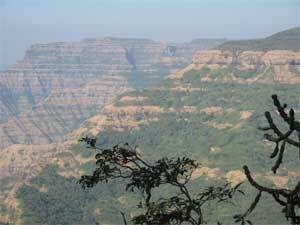 The bulk of the volcanic eruption occurred at the Western Ghats (near Mumbai) some 66 million years ago. This series of eruptions may have lasted less than 30,000 years in total. The gases released in the process may have played a role in the extinction of the dinosaurs. Before the Deccan Traps region was reduced to its current size by erosion and continental drift, it is estimated that the original area covered by the lava flows was as large as 1.5 million km², analogous to the size of Australia's Northern Territory. The present volume of directly observable lava flows is estimated to be around 512,000 km³. Mantle xenoliths have been described from Kutch (northwestern India) and elsewhere in the western Deccan. It is postulated that the Deccan Traps eruption was associated with a deep mantle plume. The area of long-term eruption (the hotspot), known as the Réunion hotspot, is suspected of both causing the Deccan Traps eruption and opening the rift that once separated the Seychelles plateau from India. Seafloor spreading at the boundary between the Indian and African Plates subsequently pushed India north over the plume, which now lies under Réunion island in the Indian Ocean, southwest of India. The mantle plume model has, however, been challenged. A large impact crater has been recently reported in the sea floor off the west coast of India. Called the Shiva crater, it has also been dated at 65 million years, right at the Cretaceous-Tertiary (K/T) boundary. The researchers suggest that the impact may have been the triggering event for the Deccan Traps as well as contributing to the acceleration of the Indian plate in the early Tertiary. 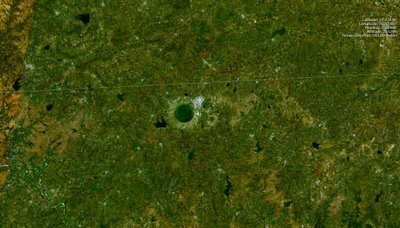 However, opinion in the geologic community is not unanimous that this feature is actually an impact crater. Also, the reported age is in the middle of the ages given for the Deccan rocks. The planet Venus is also thought to undergo vast basaltic flood eruptions, but on an even greater scale than those at Deccan Traps. It is not known whether the mechanisms are similar; Venus appears to lack Earth's plate tectonics and its internal structure may differ in other ways as well. The Deccan Traps are one of the largest volcanic provinces in the world. It consists of more than 6,500 feet (>2,000 m) of flat-lying basalt lava flows and covers an area of nearly 200,000 square miles (500,000 square km) (roughly the size of the states of Washington and Oregon combined) in west-central India. Estimates of the original area covered by the lava flows are as high as 600,000 square miles (1.5 million square km). The volume of basalt is estimated to be 12,275 cubic miles (512,000 cubic km)(the 1980 eruption of Mount St. Helens produced 1 cubic km of volcanic material). The Deccan Traps are flood basalts similar to the Columbia River basalts of the northwestern United States. This photo shows a thick stack of basalt lava flows north of Mahabaleshwar. Photograph by Lazlo Keszthelyi, January 28, 1996. The Deccan basalts may have played a role in the extinction of the dinosaurs. 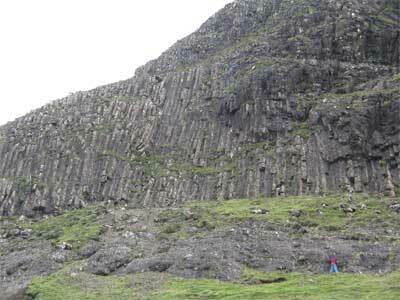 Most of the basalt was erupted between 65 and 60 million years ago. Gases released by the eruption may have changed the global climate and lead to the demise of the dinosaurs 65 million years ago. This photo shows the Deccan Tarps between Mambai and Mahabaleshwar. Photograph by Lazlo Keszthelyi, January 27, 1996. Vocanologists are also trying to understand how such great volumes of lava are erupted. Early models proposed that lava flooded across large areas at extremely rapid rates. Recently proposed models suggested that at least some of the flows are emplaced at gradual rates, lasting months to years. This photo shows the Ajunta Caves, temples carved into the basalts. Note the school group for scale. Photograph by Lazlo Keszthelyi, January 31, 1996. Ironic part: For years, I've been reading and following the ongoing dispute regarding the ultimate cause of the extinction of the dinosaurs. It seems that there is a slowly emerging consensus that it happened because of the somewhat simultaneous occurrence of two events: the Deccan Trap volcanism and the Chicxulub (Yucatan) asteroid impact. As best can be dated, the Deccan Trap volcanism occurred in the 1 million years preceding the Chicxulub impact, and the gases from the volcanism caused climate changes that made it tough to live -- and Chicxulub made it much more difficult. The ironic part is that Lonar Crater is an impact on the Deccan Trap volcanism, but is a very recent impact. Figure 4a,b,c,d. Views of the Sahyadri (Western Ghats) escarpment at Mahabaleshwar, showing the 1200-m-thick, horizontally disposed Deccan flood basalt lava pile. The top of the lava pile is a heavily lateritized late Cretaceous planation surface. 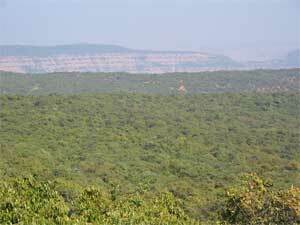 (d) The extensive, lateritized, heavily forested Mahabaleshwar plateau surface. Photos by Hetu Sheth, December 2005. The Deccan Traps is located in central west India and dates from 66 million years ago. 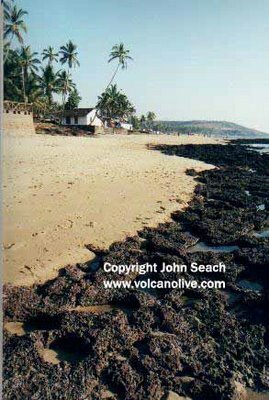 The lava flows are some of the largest on earth covering 900 km and meet the coast at the Arabian Sea. that the Indian volcanoes were involved with their decline. 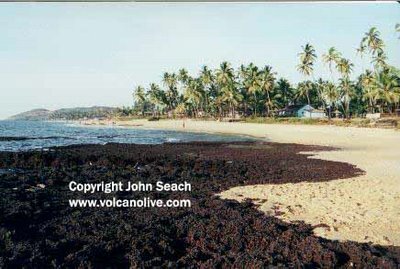 Deccan lava meets the Arabian Sea at Goa. The lava flows cover 900 km throughout central and western India. The Reunion mantle plume was responsible for the lava flows which covered 500 000 sq km.